Unworthy, meet completely worthy. Yesterday, we saw that Ruth didn’t feel worthy of the notice and attention of Boaz. Today we see how he responds. 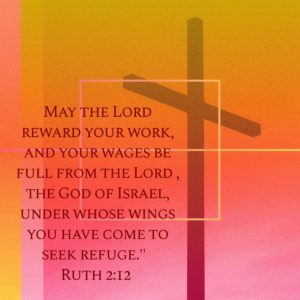 Read Ruth 2:11-12. Boaz made it very clear that his notice and attention came from him doing what God was doing. Worth and value come from the Lord. And the Lord is the one who rewards all that we do and don’t do in obedience to Him. We see that Boaz is not acting out of selfishness or personal gain, but is simply seeing Ruth as someone who didn’t know the Lord and yet trusted Him enough to make change and seek to follow Him. When we put our trust in God, He will always reaffirm that decision and will let us know that He sees us and He loves us and we are on the right path. We don’t have to feel unworthy because God Himself is worthy and through Him, He makes us worthy too.